Flash Gordon is a classic science fiction comic first written and drawn by Alex Raymond in 1934 and published by King Features Syndicate. It tells the story of Flash Gordon, an athlete who travels with reporter Dale Arden and Dr Hans Zarkov in a rocket Zarkov built to the planet Mongo, ruled by Ming the Merciless (Fu Manchu IN SPACE). Flash sets to incite revolution. But wait! Dale is in love with him, and so is Princess Aura! They are aided by Prince Barin of Arboria, Prince Vultan of the Hawkmen and Queen Desira of Tropica. Later stories featured Flash and company traveling to other planets, but the Mongo story arc is by far the most famous. Although originally a comic strip, the franchise now extends across multiple media. Trope codifier for Space Opera (although the original lengthy Planet Mongo arc, which is the only storyline most modern fans are familiar with, is more of a Planetary Romance) and Raygun Gothic, along with Buck Rogers of course. Abusive Parents: Ming threatens Aura with various punishments for defying him, from conscription in the army to having her whipped bloody. From the way he treats everyone else, he is very probably serious about it. Action Girl: Increasingly, Dale, after the first few storylines. While she was never a One-Man Army like some of the characters, she learned to handle firearms, and was competent enough by more realistic standards. Aliens Never Invented Democracy: Emperor Ming rules not only his homeworld of Mongo, but subjugates several neighboring worlds as well, organized roughly like fiefdoms. Ming shrewdly encourages these worlds to fight among themselves to curry his favor, as it weakens their defenses and confounds efforts to overthrow him. Alex Raymond's method of drawing notably evolved and improved as the series progressed. For a time he used a dry-brush drawing style with lots of hatching, as was common in Pulp Magazine black-and-white interior illustrations. Later, he switched to a clearer line style, used in conjunction with Prince Valiant-esque still images that mimicked paintings. When the strip began, the people on planet Mongo all had yellow skin (most of the time, anyway). Plus, Princess Aura was a redhead, and Prince Barin was bald. A few years in, the yellow skin-tone was dropped and the humanoid denizens of Mongo started being drawn as white. At the same time, Aura became a blonde and Barin suddenly sprouted a full head of black hair (which the strip lampshaded as him defying Ming's decrees on proper court fashion). And Now You Must Marry Me: Forced on Dale by Emperor Ming when the humans first arrived on Mongo. However, Flash interrupted before the ceremony could be concluded. Badass Normal: All the humans on Mongo: Flash, Zarkov and, yes, even Dale (though she is relatively less impressive than the men). The Baroness: Aura, when she feels like it. Being royalty, she appears to hold some sort of commission in her father's army, and sometimes dresses in their stylish uniforms. Her personality also fits the type. Beard of Evil: Ming the Merciless has one. Beast Man: Several races of Mongo, including Lion Men, Hawk Men, Fang Men, Ape Man (red and not), Blue Dragon men, Panther Men and so on. Beneath Mongo: The Cavern World of Syk. Betty and Veronica: Dale Arden and Princess Aura, both of whom love Flash. Big Fun: Vultan's got a belly on him. Bizarre Alien Locomotion: Snow dragons (dangerous beasts from Frigia) use their broad, flat tails to quickly snowboard down slopes. Characterization Marches On: Vultan of the Hawkmen is generally thought of as Flash's heroic ally by the fans (and most adaptations), albeit in a Proud Warrior Race Guy sort of way. In the original series, he is introduced as one of Ming's semi-loyal vassals, and arguably even more sadistic and murderous than the Emperor himself, with his onscreen atrocities including torturing Flash and beating and sexually abusing Dale. Damsel in Distress: Dale often plays this role. Subverted in some instances, where she can save herself; and at least once there was an inverted example when she saved Flash. Dark Action Girl: Aura, who could handle both weapons and aircraft and was rarely squeamish about even onscreen deaths, unless they inconvenienced her somehow. Distressed Dude: Flash, especially when the captors are women. Everything's Better with Princesses: Aura, among others. Evil Laugh: Ming the Merciless has one. Game Changer: Flash Gordon is the game changer in his series: before he arrived on Mongo, various worlds under Ming's thumb were fighting each other. Flash slowly convinced the various worlds to set aside their differences and concentrate instead on overthrowing Ming the Merciless. Gladiator Games: Flash is often forced into these. Green-Eyed Monster: From the hawkmen's king's wife, when he decides to add Dale to his harem. She and a couple of jealous concubines tried to kill her by throwing her out a tower window. Green-Skinned Space Babe: Yellow-skinned, here. For the first several years at least. Hard Head: Thun. Flash can even confidently assert he'll come to in a few seconds. HeelFace Turn: Vultan, Aura, Azura... actually, a lot of Flash's allies started out as antagonists. Aura's reaction, when Flash finally makes clear that he prefers Dale to her, even after she saved his life twice. Then subverted, as she finds that, for all the indignities and troubles she has suffered for his sake and her grief over his rejection, she still can't bring herself to kill her fugitive beloved. And then double-subverted, as she settles for just torturing him, instead. Inevitable Waterfall: When Flash, Dale, and Thun are swept away in an underground river. It's Up to You: Only a wayward athlete can save the Earth. Kaiju: Mongo just wouldn't be Mongo without giant monsters everywhere. In one instance, Gordon gets randomly attacked by a giant snake while walking around with Azura. Lack of Empathy: Ming's people are said to have this as a racial trait. In practice it ends up downplayed, as many of them do show some empathy, but still less than one would expect of humans. Lizard Folk: The Lizard Men. They try to capture and cook Gordon, but are quickly dispatched by the Hawkmen. Mad Scientist: He's a nice guy, but Zarkov's got more than a touch of this, at least in the beginning. Mad Scientist's Beautiful Daughter: Not so much Mad Scientist as Emperor, but still a major influence. "Aboard an eastbound transcontinental plane we have Flash Gordon, Yale graduate and world-renowned polo player, and Dale Arden, a passenger." Ming orders that if Dale is to be a fit wife for him, she must be cured of her Earth-human mental failings—which include empathy, love and other irrational human sentiments. His doctors have machines that can easily bring this about, however, using rays to cut off the relevant brain centers with something similar to what we might call laser surgery today. Much later, Azura brainwashes Flash for a while. She uses drugs rather than machinery, and the effects of her treatment are not permanent. Multicultural Alien Planet: Because the comic is set entirely on Mongo and doesn't do any standard planet hopping (at least, not until the strip's later years), Mongo is an incredibly diverse planet. Names to Run Away from Really Fast: Ming the Merciless. Overshadowed by Awesome: Dale Arden. Many fans nowadays tend to consider her a useless Damsel in Distress who does little but being rescued, but looking more carefully, she actually comes across as very competent. As depicted in the original newspaper comic, she handles weapons and vehicles, demonstrates considerable outdoor survival skills, and shows quite remarkable feats of both endurance and fortitude (physical and mental) as well as composure and quick thinking under fire. Measured against real-life standards, even for trained soldiers, she is very much not bad. However, with Flash a regular hypercompetent pulp sci-fi hero, she naturally does not look as impressive next to him. Petting Zoo People: Lion Men, among others. Planet of Hats: Actually averted in the original strip. Ming's empire was dominant on Mongo culturally, economically and politically, but there were several subject states with considerable autonomy, each with its own unique ethnicity and culture. Though everyone apparently spoke the Ming language, at least well enough to communicate with each other. Planetary Romance: For one thing, Aura and the various moons of Mongo. Power Trio: Flash, Dale and Zarkov. Proud Warrior Race Guy: Lots of them, but Thun's Lion Men and Vultan's Hawkmen were probably the most notable. Puny Earthlings: Who can save you now? Random Events Plot: Unsurprising, in view of the need for a cliffhanger. 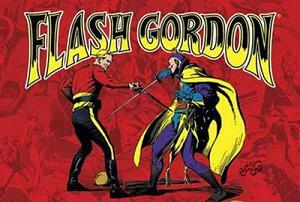 Raygun Gothic: The entire concept of Flash Gordon embodies the trope. Real Life Writes the Plot: ...and as World War II creeped even closer, Ming the Merciless got mercilessly and unceremoniously killed off so that Flash and friends could return to Earth and lend a hand in the war effort. Retro Rockets: Your classic cigar-shaped rockets with tail fins. In the film serials, they actually puff smoke! Robin Hood: The obvious visual inspiration for Barin and the Arborians. Schizo Tech: Ming's armies can be portrayed as everything from highly futuristic to medieval. Justified to some extent, in that the swordplay and pageantry are usually part of highly ritualized and symbolic trials of combat, not serious, "real" warfare (for which they break out the spacecraft, ray guns and heavy armor). And, of course, by Rule of Cool. Shock and Awe: Part of the arc in the Snow Kingdom is dedicated to hunting down a colossal monster that blows people up with his electrified tentacles. Straw Misogynist: Vultan, who keeps his wives captive in a harem and is violent and abusive toward both them and Dale (and bashed for it in turn by Flash). Surprisingly averted with Ming, who has no problem with female soldiers and seems even to encourage Aura's Action Girl tendencies. Tap on the Head: Aura uses one on Flash to let her father carry off Dale. Thicker Than Water: Even after Aura was married to Barin, and so more or less became one of the good guys, she did not want her father to be killed by them, and warned him of Flash's impending surprise raid on his field headquarters. 20 Minutes into the Future: Prior to WWII, there was no date given. Following WWII, they were set "ten years into the future". The Vamp: Queens Azura and Desira. Villainesses Want Heroes: Flash and every female villain, though Aura is the most persistent example. Justified, since the human species is both exotically beautiful and physically superior by Mongo's standards, hence extremely attractive; Dale gets equivalent attention from most male villains. We ARE Struggling Together: This is why Ming isn't overthrown; the races of Mongo are busy fighting amongst themselves. White Anglo-Saxon Protestant: Flash Gordon is a Yale man and champion polo player. Would Not Shoot a Civilian: Flash objects at the notion of killing an unarmed Aura.